The first 10 I’ve given in a long time. This hostel was absolute bliss!! Zero complaints. Lovely garden, pool, facilities and staff! Even crepes for breakfast...bravo! Great chill atmosphere to meet the few other backpackers there are in South America. Location is prime. The owners are top shelf. Staff are helpful! Only suggestion - have drink specials (they aren’t super expensive), but a happy hour or 2 would be a community builder for the peeps staying there! El Nómada is a fantastic hostel. The staff are very friendly and helpful, the breakfast is a good selection, and the pool is nice after long, hot days in Asuncion! Highly recommend. Very nice histel with good vibes and one of the best breakfast I had so far in SA! Decent hostel, staff new a lot about the area, good bar :) unfortunately I woke up too late to enjoy breakfast but I got to eat some leftover cake which was delicious! Super nice place, staff is great and helpful, location us just perfect and it is clean safe and comfortable so it was the right choice for me in Asuncion. Very nice garden. The stove in the kitchen could have been better though; it was very slow. 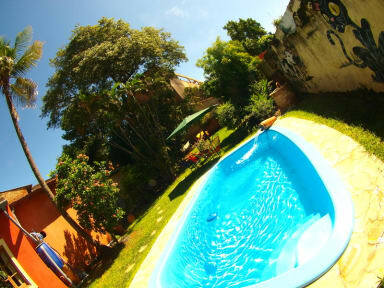 Good hostel with a nice chilling area around a pool in the backyard. The single room I had was well equiped. I recommend to stay there.